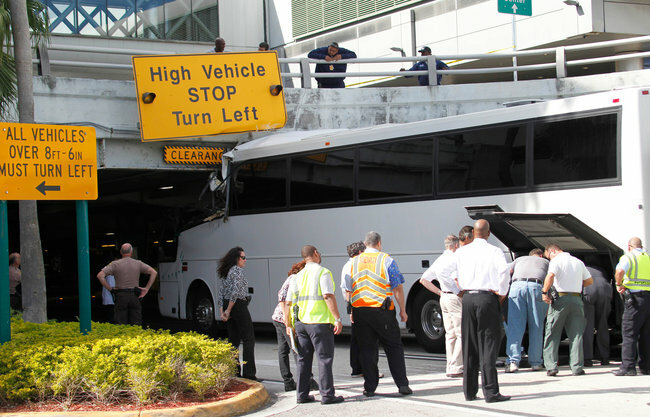 A normal traveling day at Miami International Airport turned into a surreal and deadly scene when an 11-foot-bus crashed into an 8-foot 6-inches overpass. The bus crash killed two of the passengers while several others were taken to Jackson Memorial’s Ryder Trauma Center and remain in critical condition. The bus driver, Ramon Ferreiro, made a wrong turn off Lejeune Road and entered the airport by error. Ferreiro continued on, passing several road signs warning tall vehicles to stop and turn around. Seconds later, the 11-foot tall bus approached an overpass which it could not clear and the bus crashed at full speed with the concrete-overpass. Among the 32 bus passengers, 13 were critically injured, and 17 were transported to local hospitals with non-life-threatening injuries. Serfin Castillo, an 86-year-old Miami resident was killed on impact. 56-year-old Francisco Urana died from his critical injuries shortly after arriving at the hospital. Tagged: "Alberto Hernandez", "Bus accident", "bus crash", "Francisco Urana", "Mayling Hernandez", "Miami Bus Service Corporation", "Ramon Ferreiro" and "Serfin Castillo"
On Tuesday, January 24, 2012, at the intersection of Northwest 17th Street and 7th Avenue in Miami, Florida, a FedEx truck collided with Miami-Dade Metrobus Route M.
At the time of the collision, 30 passengers were on the bus. Among them, a 16-year-old girl who was riding the bus in a wheelchair. Lt. Ignatius Carroll of the City of Miami Fire Rescue told reporters that first responders were very concerned about the teenage girl, not knowing what condition she was in before the collision and obviously bracing themselves for the worst outcome. But thankfully, “as we started assessing patients inside the bus, we found that more people were complaining about injuries and that turned into a Level 2” added Carroll. Injured Passengers were transported to Doctor’s Hospital, Jackson Memorial Hospital, South Miami Hospital and Mount Sinai Medical Center. Florida Law is very clear. After the injured were cared for, the police assessed the cause of the collision and determined that the driver of the FedEx truck failed to stop at the red light of the intersection. Unable to stop his truck, the driver could not avoid slamming into the passenger-loaded bus resulting in several people being injured.